The most distant galaxy ever seen in the universe has been detected by NASA’s Hubble and Spitzer space telescopes. Light from the newly discovered galaxy, which astronomers have named MACS0647-JD, reached Earth after travelling across space for 13.3 billion years. It provides a window on what the galaxy looked like just 420 million years after the big bang, when the universe was only three per cent of its current age. 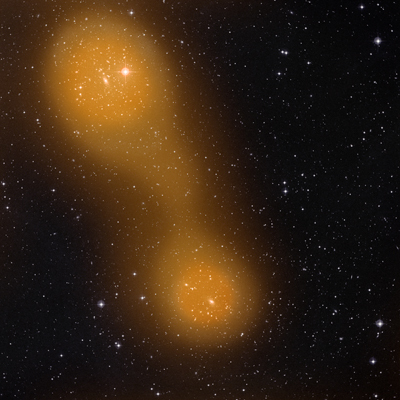 The galaxy was detected using an effect known as gravitational lensing, where large clusters of galaxies are used as “natural zoom lenses” to enlarge the appearance of galaxies behind them. 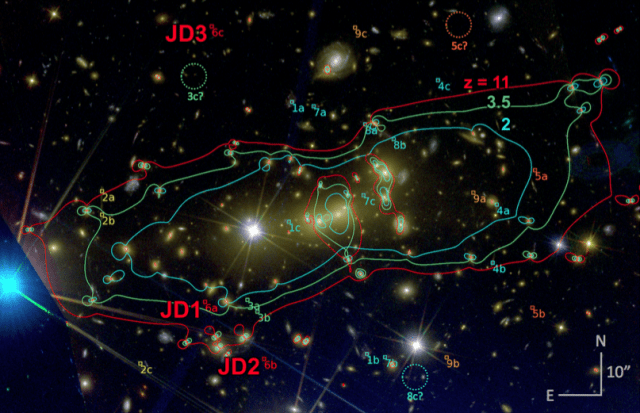 Astronomers were able to detect a hint of light from MACS0647-JD because it was magnified as it passed around an enormous galaxy cluster known as MACS J0647+7015 as it travelled towards Earth. Thanks to the gravitational force of the cluster, the Hubble telescope was able to detect the light at up to eight times the brightness it otherwise would. ScienceDaily (Oct. 23, 2012) — NASA’s newest set of X-ray eyes in the sky, the Nuclear Spectroscopic Telescope Array (NuSTAR), has caught its first look at the giant black hole parked at the center of our galaxy. The observations show the typically mild-mannered black hole during the middle of a flare-up. The new images can be seen by visiting: http://www.nasa.gov/nustar . (Phys.org)—European astronomers have discovered a planet with about the mass of the Earth orbiting a star in the Alpha Centauri system—the nearest to Earth. 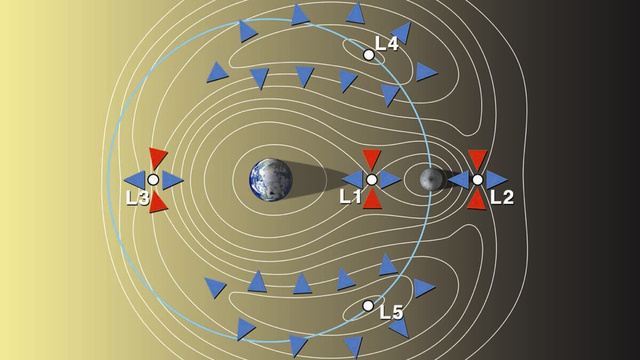 It is also the lightest exoplanet ever discovered around a star like the Sun. The planet was detected using the HARPS instrument on the 3.6-metre telescope at ESO’s La Silla Observatory in Chile. The results will appear online in the journal Nature on 17 October 2012. 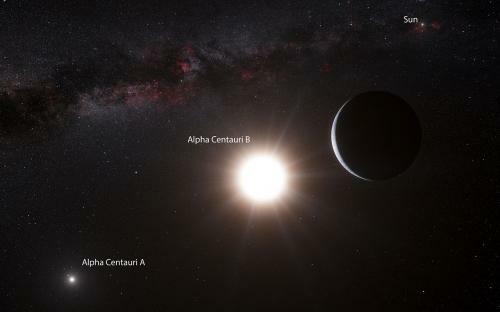 Alpha Centauri is one of the brightest stars in the southern skies and is the nearest stellar system to our Solar System—only 4.3 light-years away. It is actually a triple star—a system consisting of two stars similar to the Sun orbiting close to each other, designated Alpha Centauri A and B, and a more distant and faint red component known as Proxima Centauri. 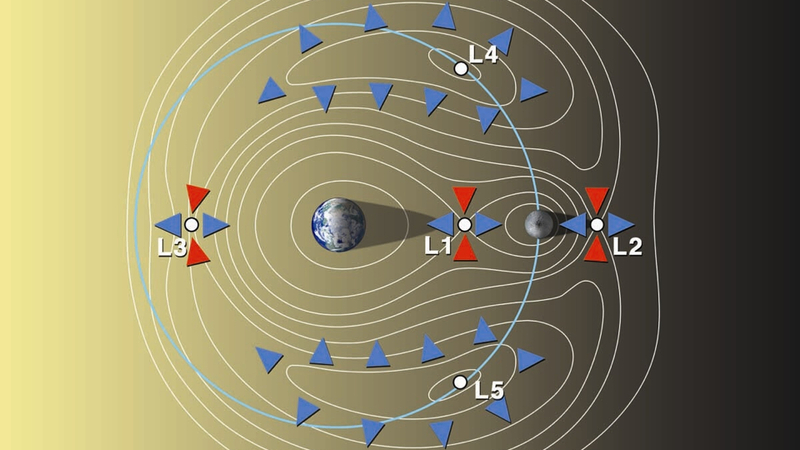 Since the nineteenth century astronomers have speculated about planets orbiting these bodies, the closest possible abodes for life beyond the Solar System, but searches of increasing precision had revealed nothing. Until now.